Remember to buy your Rockford Icehogs Tickets by March 17th! In celebration of March as American Red Cross month, the Rockford IceHogs are teaming up with the Rock River Chapter to raise funds for Rock River Valley-area disaster victims. The IceHogs are hosting an American Red Cross night against the Chicago Wolves at 7:30 p.m. on Friday, March 28. To help support this cause, you can purchase tickets by clicking this link. The money will help provide disaster victims with personal care items, emergency shelter, case management and supportive services. For the special Red Cross promotional rate to apply, you must purchase tickets by March 17. I hope to see you there! If you attend you will also get to see who wins the brand new laptop for our button design contest as well and our brand new Rock’n for the Red commercial. The Rock River Chapter of the American Red Cross will do their part to assist those affected by the tragic incident at Northern Illinois University. Six Red Cross volunteers who are licensed to provide mental health services in Illinois will be in Dekalb, Illinois through Tuesday as students return to campus. In conjunction with National Red Cross Month, Culver’s restaurants of the Rock River Valley are among more than 370 Culver’s restaurants donating 10 percent of their respective sales on Wednesday, March 5 to their local participating American Red Cross chapter during the annual system-wide “Day of Giving” fundraising event. The Rock River Chapter will then use 100 percent of the funds within the local community. Guests can enhance the total Red Cross contribution by giving personal donations in canisters available at stores throughout the week. Building on last year’s success, Culver’s fundraising goal for the one-day event is $175,000. Culver’s was recently recognized with the Circle of Humanitarian Award from the Red Cross for the substantial support that the company and its franchise partners provided in 2007. Culver’s restaurants are independently owned and operated in more than 370 locations in 16 states. 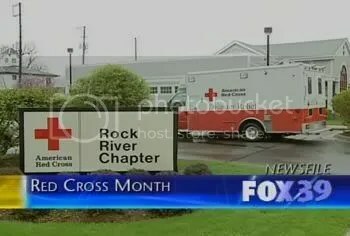 The American Red Cross became a partner in 2007 and since then a number of local, regional and system-wide programs raised funds and awareness for their efforts. Culver’s is the recipient of numerous awards, including the #1 burger chain in the country as voted by Restaurants & Institutions 2007 consumer survey. Tony Gasparini talks about Rock’n for the Red and the button design contest on MyStateline.com. The winner of the contest gets a brand new laptop donated by American TV & Appliance. Thanks for going on Tony – you did a wonderful job!! Don’t forget to vote for your favorite button! Rock’n for the Red – Vote for the Winner TODAY! We’re currently having a button design contest, involving local schools from the NIC 10, for our new signature event called “Rock’n for the Red.” This event is to celebrate HEROES for the American Red Cross in the Rock River area. The event will have bands, Red Cross education, an award ceremony, and it only cost $5 for a button to get in. The winner will be announced March 28th at our Red Cross night at the Rockford Icehogs game vs. the Chicago Wolves. The designer of the winning button will win a new laptop computer provided by American TV and Appliance. Click here to vote for a winner!! Tony Gasparini, a long-time Red Cross volunteer and Chair for Rock’n for the Red, will be on Channel 17 WTVO tomorrow morning on Daybreak to discuss Rock’n for the Red and the button design contest as well! The IceHogs are hosting an American Red Cross night against the Chicago Wolves at 7:30 p.m. on Friday, March 28. To help support this cause, you can purchase tickets for $13 (upper sideline) or $16 (lower Endzone) by linking through our Chapter’s website: www.rockriver.redcross.org and just click the link on the lower right hand side of the page. You may also contact Cedric Johnson at (815) 963-8471, ext. 20 or stop by the American Red Cross Rock River Chapter located at 727 N. Church Street in Rockford to order tickets. The Rockford IceHogs will donate $4 for every ticket sold (through the website or using the keyword REDCROSS when buying tickets) to help the Chapter serve those most in need. The money will help provide disaster victims with personal care items, emergency shelter, case management and supportive services. If you would like to learn more about services provided by the Red Cross or how to make further donations please contact the Rock River Chapter at: (815) 963-8471. For the special Red Cross promotional rate to apply, you must purchase tickets by March 17. You are currently browsing the American Red Cross - Rock River Chapter Blog blog archives for February, 2008.